Although I have almost an acre of land, most of it is low-lying forest and wetlands. My backyard is a narrow strip, with the sun hitting part of it only 6-7 hours a day. I do my best, trying to plant crops in the space that gets the most sun. It’s a challenge when I have to rotate plantings each year. The photo below was taken last summer (2014). That is pretty much my entire backyard. 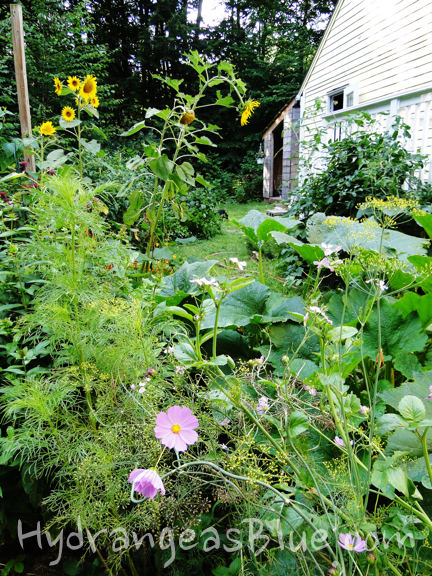 I plant flowers and vegetables along the edge of a slope, which drops off to woods beyond. Only the part near my deck gets enough sun for good vegetable growth. I concentrate my plantings there. 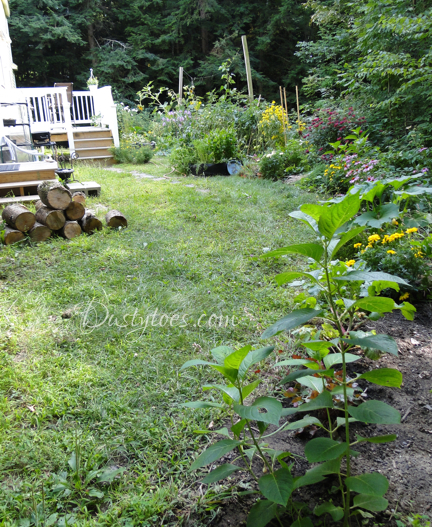 Photo Above: See my new propagated hydrangea there in the front? 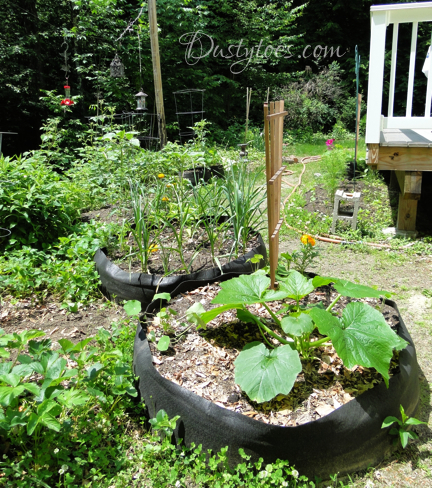 I’ve added raised fabric beds to the area, which has been a great help. Last fall I planted my garlic bulbs, and they are doing very well – better than any garlic I’ve ever attempted to grow. I hope the bulbs will end up being nice and big. 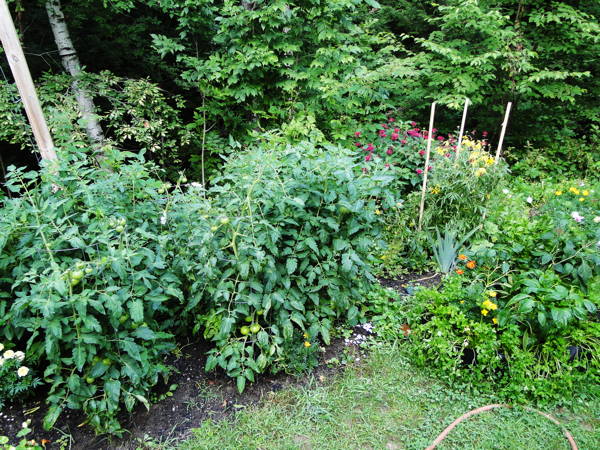 What begins as lots of space, quickly fills in when the plants grow and expand. The tomatoes grew great last year (picture below) right up until they all died of late blight! It was depressing. 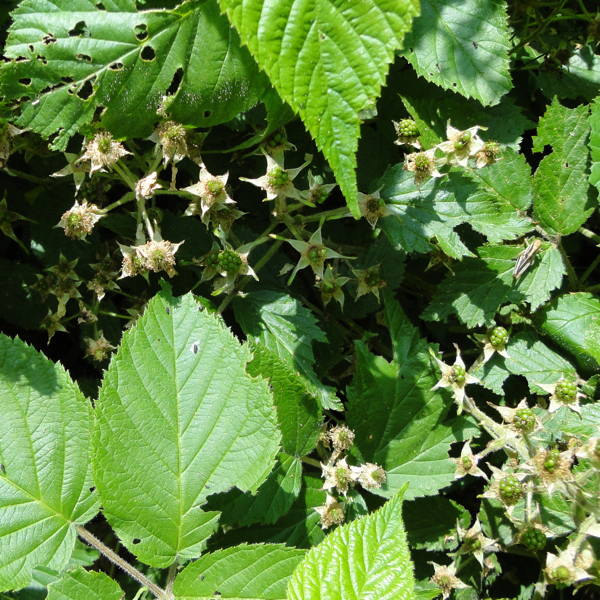 It’s a constant battle with the black raspberry plants (or are they blackberries?) that threaten to overrun the yard. They grow upwards from the slope, where I think they were purposely planted to hold the earth in place. It’s one of the few berries I dislike. It figures that I have tons of them! They are eaten by the chipmunks and birds, when my cats are not around. Raspberries grow at the side on my house, and I can find many wild strawberries in the yard. The strawberries I planted have become overrun by weeds, and I didn’t have enough space for a proper strawberry field. Occasionally I find a few nice ripe berries to munch while I survey my garden. The sunflowers are volunteers that sprout wherever they choose. The seeds self-plant from when I feed the birds in winter. I sometimes wish I had acres of land to roam and plant, but I’m content with what I have. It takes a lot of time to garden, and especially when you do it all alone.